I am not good with movie reviews. It's such a different feeling from reading a book, but I will give it a go. 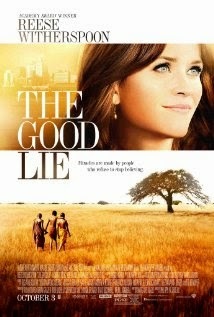 The movie is about a bunch of kids from a Sudanse village. After soldiers attack and kill everyone they are the only ones left standing. So they trekk over Africa to find a place to settle, to find help. Instead they find other refugees, death, soldiers and destruction. Eventually they make it to Kenya and a refugee camp. 13 years later they get the news they waited for. They can go to America. The cultural clashes hit at once. Everything is different, but at least they have each other. Now they must find jobs and go on with their lives. But the scars from war haunt them all, they lost so many. And yes Reese is in the movie, later on. She is an employment agency worker and help them find jobs, and eventually becomes envolved in their lives. It was a good movie. It showed the horror of war, and what is still happening there today even if most have forgotten or turned a blind eye to it. It's genocide. I liked how they stuck together, even if not related by blood. Their will to live was strong. I even liked how they missed their cows. I would recommend it. And it's more of a thinking movie, you need those too. I really like Reese and I confess that I'm intrigued by this movie now too.